this morning bruce joined me at the middlesex fells reservation in medford in my continuing weekend search for red efts. 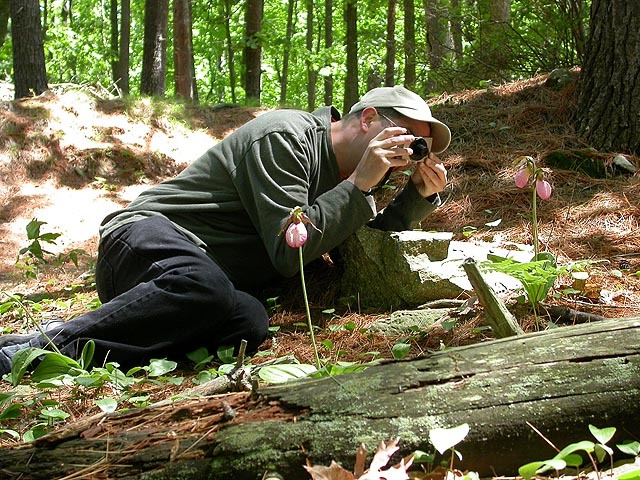 he himself had seen efts on many occasions (not in MA though) so at least someone on this expedition had first hand knowledge of them. i went over to his place at 9am as we scheduled but he was still sleeping as he greeted me in his bathrobe, explaining that his alarm never went off. after he finished getting ready, we left in his car. the sky was crystal clear, the temperature was comfortable, although there was a strong wind blowing through town. i figured today would be a great day to see newts since it rained most of the day yesterday. unfortunately, the forest was pretty dry when we were there (some flooded reservoirs were the only sign of the prior day's precipitation), which significantly decreased the chances of spotting efts. the fells is an MDC reservation as well, which meant it's free, therefore a lot more visitors, so there's a lot less "unspoiled" habitats. a lot of these visitors also use the place as a dog park (even though a sign said all dogs must be leashed), and nothing escapes the attention of curious canines. before we entered the reservation, i covered myself thoroughly with bug spray. bruce decided to rough it, banking on the notion that the strong wind would stop the mosquitoes. i wasn't willing to take that chance. 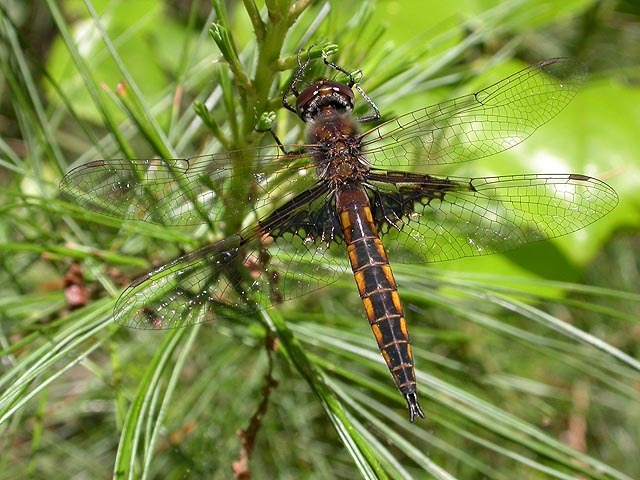 (male) we spotted two new dragonflies i've never seen before: the baskettail and the springtime darner. the baskettail we saw early on, just the fact that i've never seen one before and was able to get some good photos made the trip worthwhile. 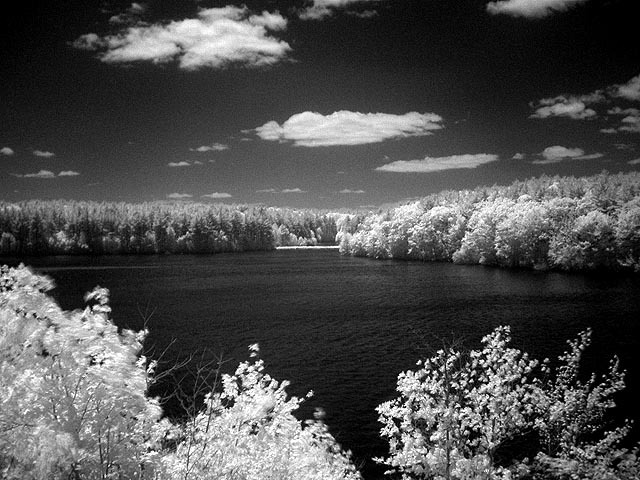 later, at a sunny location by the edge of the reservoir, we saw a whole bunch of dragonflies sunning themselves and establishing territories. 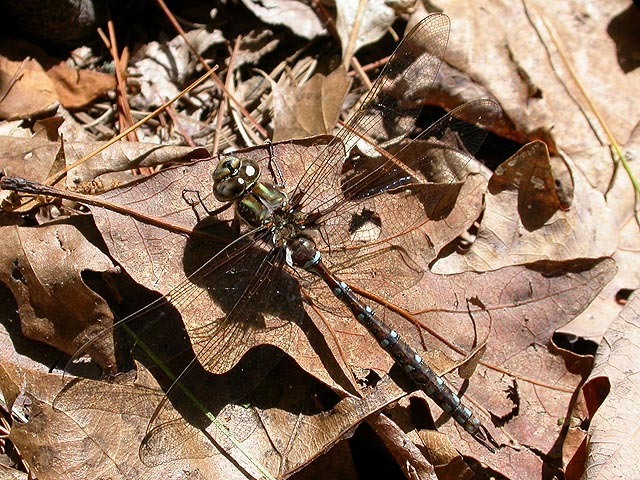 that's where we spotted the springtime darner, another first. from the abdominal appendages you can see that it's clearly a male. the rest were more baskettails, which can be sexed by the wings (males have dark patches on the lower wings, females are just clear). 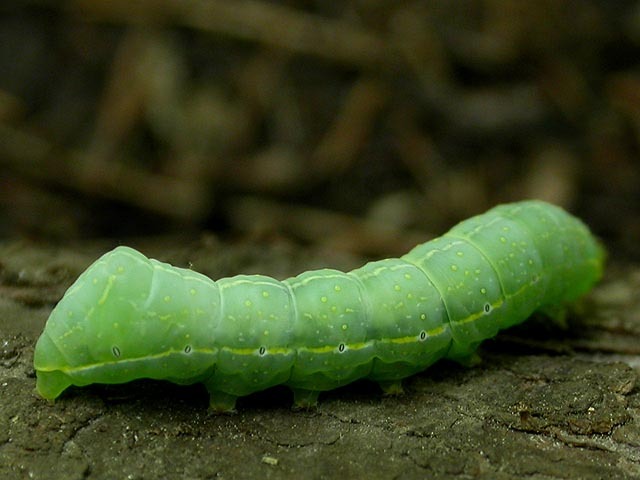 there were a lot of these fat green caterpillars, about an inch long, which i originally suspected were the well fed versions of typically smaller inchworms, ready to transform into moths, but i was wrong. i'm not quite sure what these are, i'll need to consult a butterfly field guide at a later date. i also spotted a dark looking caterpillar, unidentified as well. pale corydalis found growing in the rocky crevasses on top of winthrop hill, i was only able to identity them as some variety of corydalis because i have corydalis growing in my own backyard (different type though, low-lying, and with denser clusters of yellow flowers). (bird song) this unidentified bird (about 7") was singing from the treetops on wintrop hill. even after consulting with various birding field guides, i still can determine what bird it was. hopefully somebody can tell me. tent caterpillar by itself, the tent caterpillar is quite beautiful, a stripe of white bordered by orange with blue dots along its sides. 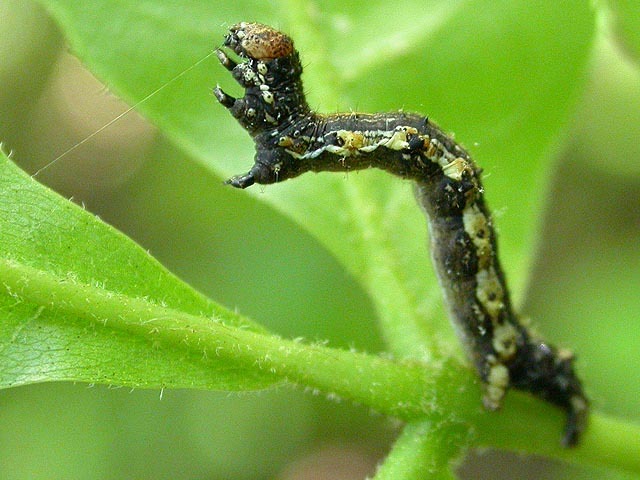 it's only when its combined with thousands of its brothers and sisters as they defoliate the forest do they appear ugly. 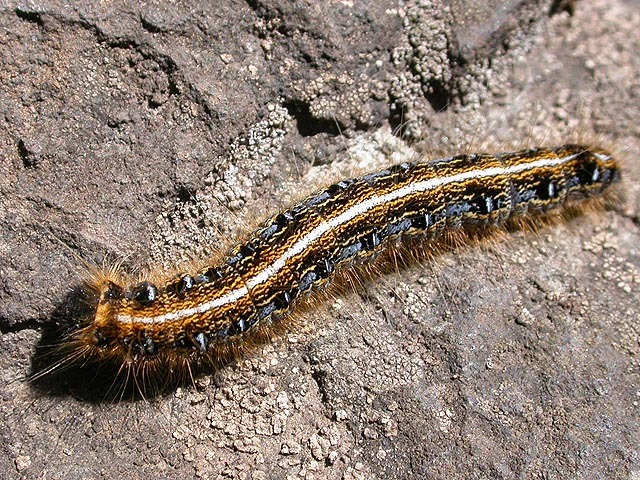 bruce and i thought about burning the "tents" that we saw, at the risk of setting the entire reserve on fire (i'm sure nobody would blame us, everyone hates these caterpillars anyway). 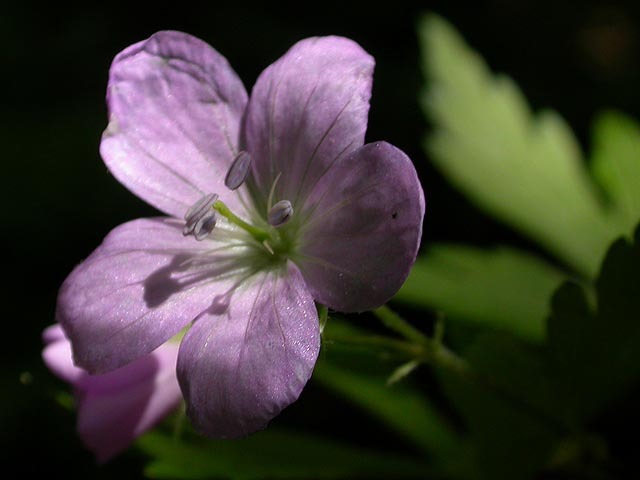 wild geranium wild geraniums dotted the edge of the trails. 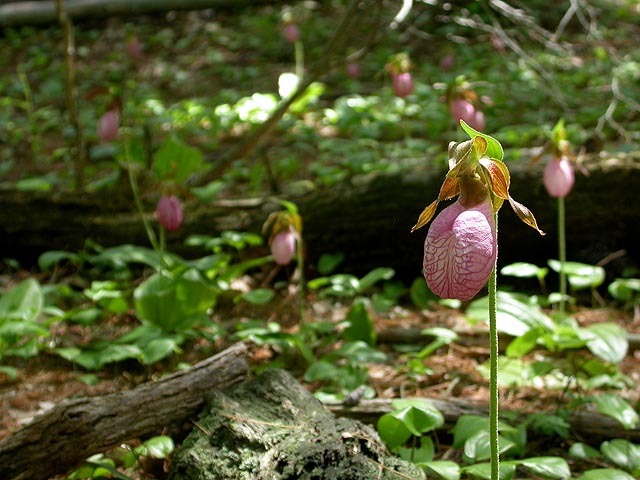 they were interesting when we first saw them (first spotted in the same area as the dead snake, below the northern side of winthrop hill), but after seeing them everywhere, they lost their novelty, unlike lady slippers, which we were always glad to find. (warning: graphic) "i think there's a snake here," bruce said calmly while i was preoccupied with taking some photos elsewhere. 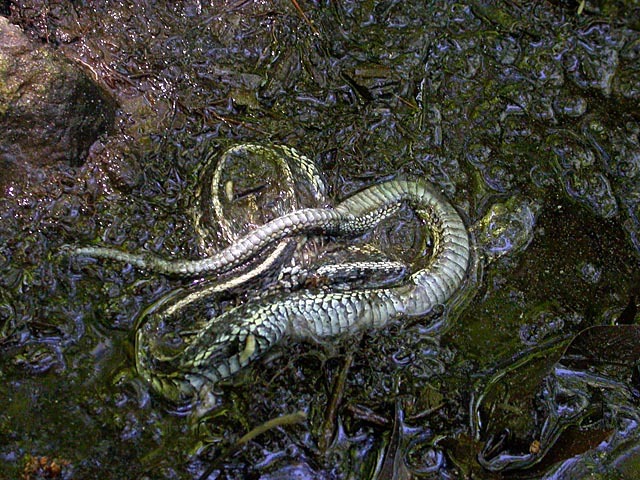 i went to see what he was talking about, and sure enough, there was a dead snake half buried in a small muddy stream. it was a ribbon snake, cause of death unknown. it was kind of gross, made worse when a dog contaminated the "crime scene" by stepping on the carcasse and then trying to eat it. "no no no!" i screamed, pushing the dog away. its owner never knew the awful truth, but their dog almost did something very bad. coral mushroom bruce spotted a patch of coral mushroom (later identified as crown tipped coral) along on the white trail north of winthrop hill. 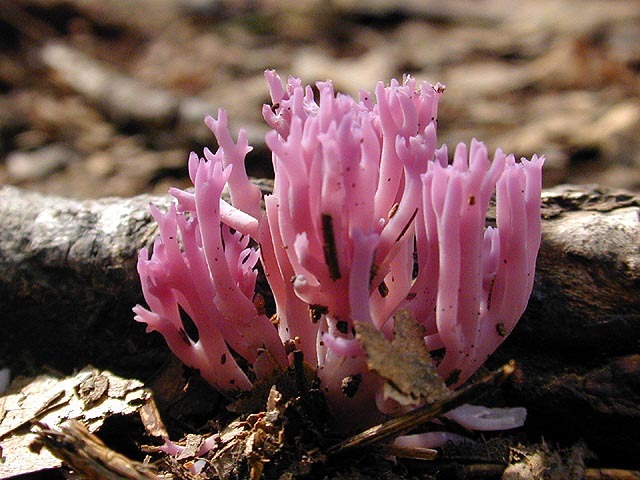 the most beautiful coral mushroom i've ever seen was found in habitat (belmont) last summer (with bruce), a violet-branched coral. 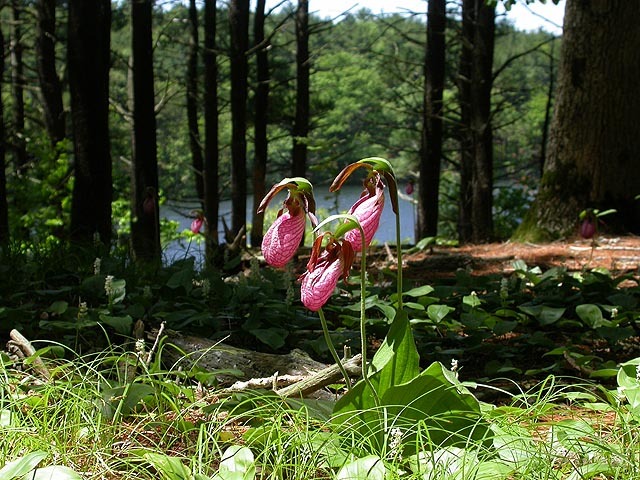 walking down winthrop hill we saw several lady's slippers. 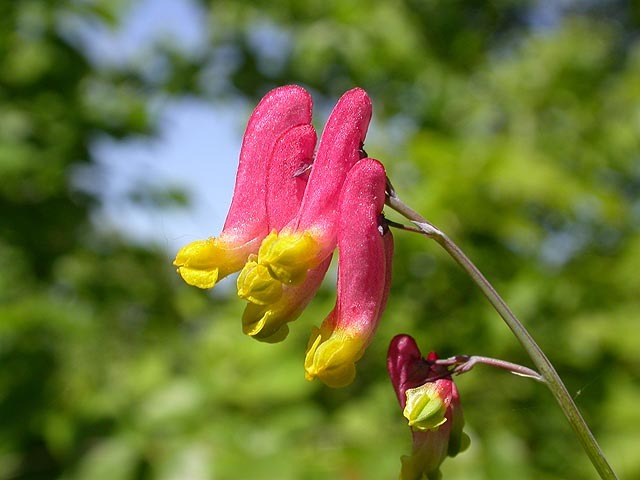 bruce and i both agreed that they resembled male scrotums, and decided that lady's slippers wasn't a fitting name for something so inherently masculine in shape, so we started calling them "mansacks". 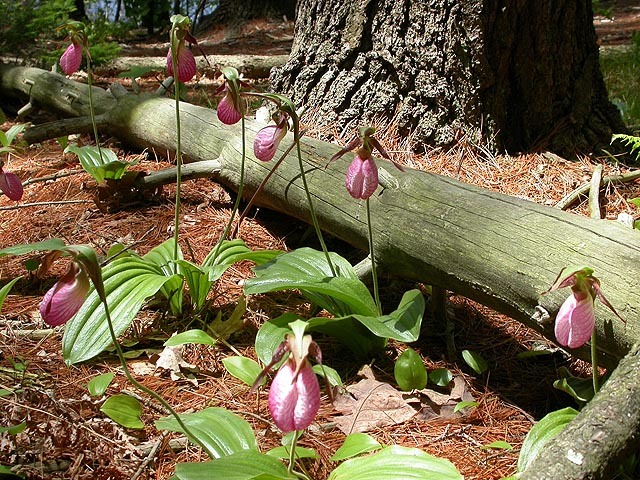 as we made our way further along the white trail, we saw more and more mansacks, until we arrived at whole forest floors dotted with these pink orchids, with signs that even more will bloom over the coming weeks. bruce made the connection between mansacks and pine trees, that they usually appear underneath those trees. i was most curious about how they reproduced, whether they were bulbs, or perennial roots, or underground runners. when i got home i did some research and found some info on how they reproduce. 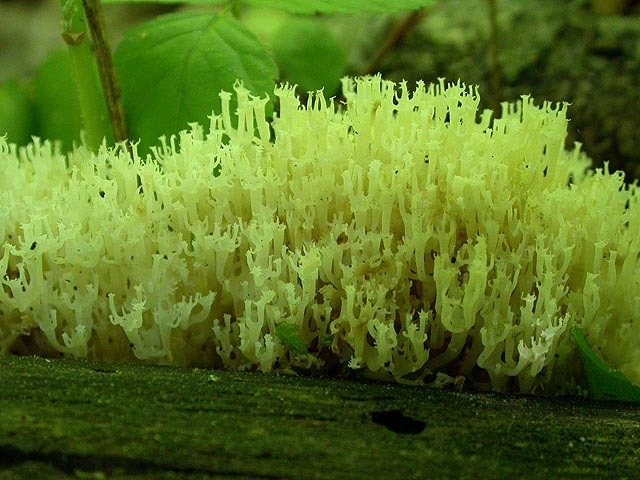 it's complicated, and involves a particular fungus in the root system in order to activate germination, and even then, it might take a decade or two before they bloom in the wild. orchard spiders in the same place where we saw all those dragonflies by the reservoir, there was also a pair of orchard spiders. 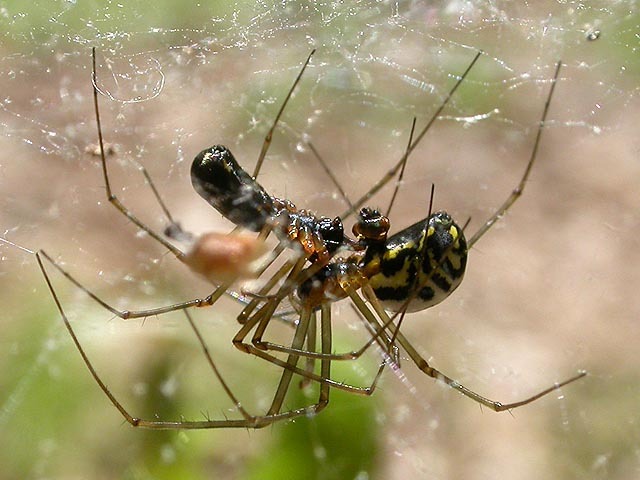 watching them closer, i noticed they were in fact mating, the male (small, skinnier) performing a mating dance by tapping on the female's abdomen with his pedipalps. once again, a first time observation of such a behaviour. early tachinid this is probably something most people don't pay very close attention to, but there are many species of flies. like the early tachinid fly, the first time i've seen one. 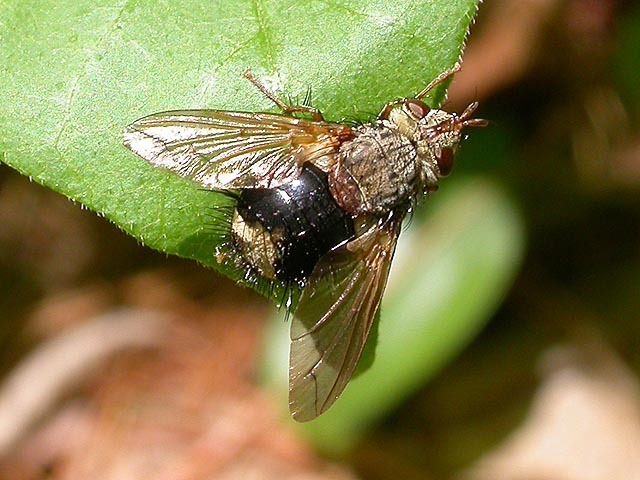 they look sort of gross, but these are actually beneficial insects (despite its gruesome appearance): the adults lay eggs on caterpillars, and the larvae eat its host alive from the inside out. this one was in a patch of poison ivy, bruce watched in horror as i trampled my way through to get the photo. 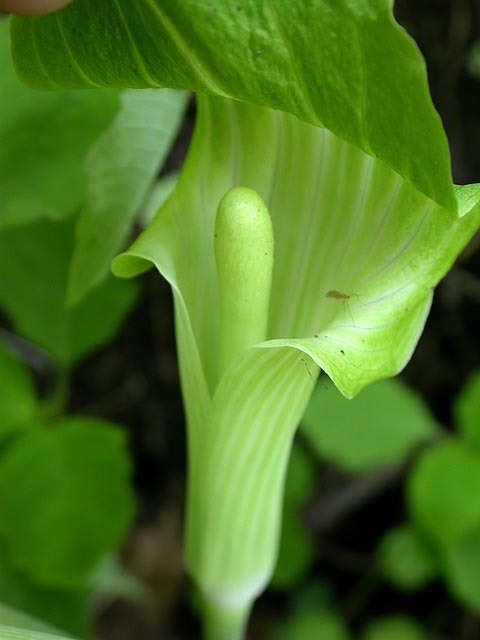 i've never seen a jack-in-the-pulpit out in the wild before. i have seen them at one of the cambridge secret gardens last year, and mahoney's sells them as well (i think something like $15/plant). they remind me of callas lilies (i wouldn't be surprised if they're in the same family). 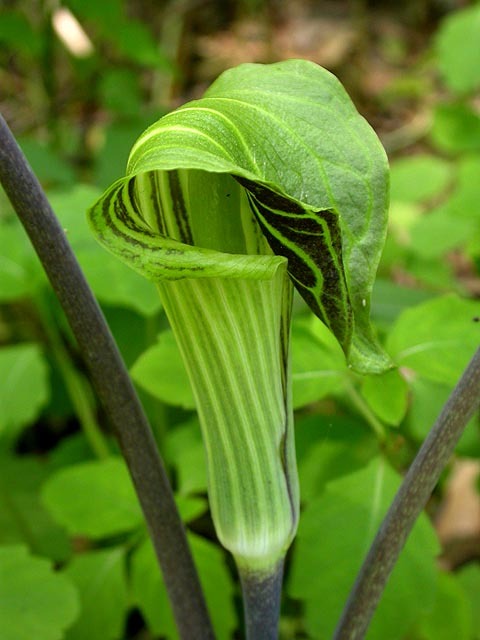 jack-in-the-pulpits, like lady's slippers, have an obscene look to them as well, although the resemblance (to particular parts of the female anatomy) isn't as great as the resemblance of lady's slippers to mansacks. after almost 4 hours of wandering in the fells, we finally found our way back. at some point we were lost and had to rely on the GPS, which made us less loss but still offered us some confusion (for instance, it didn't exactly point in the right direction). we saw an elderly couple in the end and followed them back to the parking lot. there was a large map of the reservation on a bulletin board, what we thought was bear hill was in fact winthrop hill (i had marked it wrong on the GPS the last time i came here). exhausted from all that walking, we went back to cambridge. back at home, i was hungry (i only had cereal for breakfast), and heated up the remaining two slices of pizza from last night for a late lunch. after some time to allow the food to digest and to watch the end of the red sox game (they lost to the mariners), i changed clothes and went out for a run. i briefly thought about the wisdom of my decision, since i just walked a lot of miles in the forest and my feet were sore. but the weather was too nice (the pressure to do outdoorsy stuff was too great) so i went out. i had a nice run, but cramped up at one point and walked across the eliot bridge, only to start it back up and finish out the loop running fast and hard. after taking a hot shower, i went next door to star market and bought some hot chili peppers for my mother and a bag of marshmellows for tomorrow's cookout at my parent's place. as if i didn't get enough foot exercise, i walked a mile to my parents' cafe. i went pretty slow and i could feel one of my legs giving away into a limp. i was also reading a book (a forest field guide) which make my walk even slower. eventually i got there however. 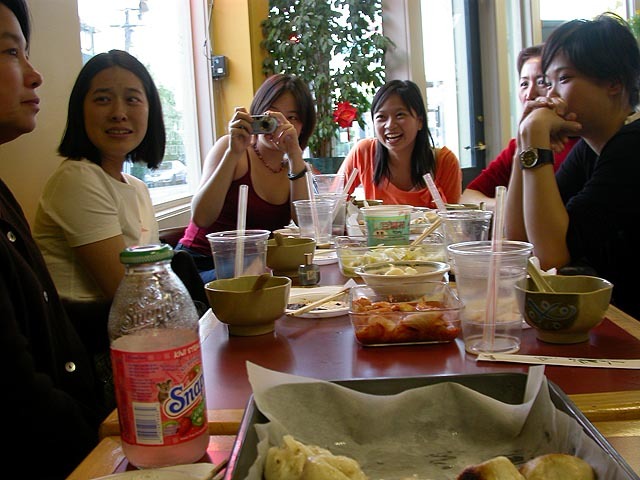 my godmother and jack's girlfriend were already there at the cafe, along with my parents and aunt. 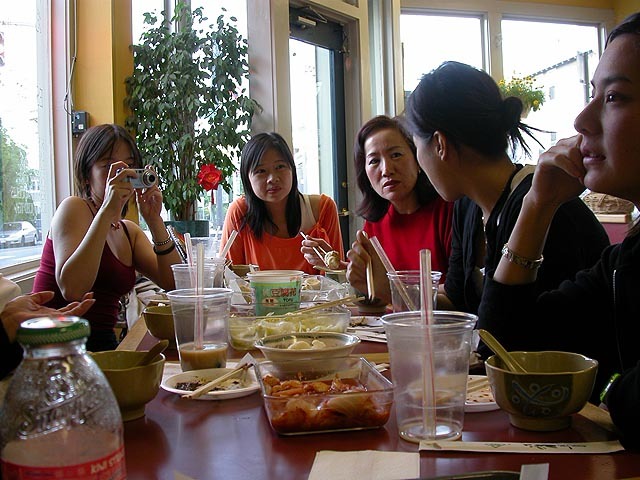 everyone was preparing for dinner, which we had there, along with our family friend from costa rica (back from a day of newbury street shopping), her three daughters, and one of their cousins (whom i've been told is the offspring of a famous politician in taiwan). the three daughters i've all met at various times: the oldest daughter came over to our house for her very first thanksgiving dinner, the second daughter i met in costa rica, and the youngest daughter i've seen on occasions at my godmother's place since she was going to school here in boston. the main course was senjianbao (pan fried meat buns). the topic du jour was about husband and wife arguments and who usually wins and who has a worse temper and then later they talked about costa rican wild life horror stories: giant scorpions in hotels, humongous poisonous toads hiding in toilets, smuggled marmosets dying of heat exhaustion, vicious macaws, scary howler monkeys, and a nasty case of jungle ticks infestation. thankfully dinner was over by then, with desserts of fresh brownies and cherries. they were eager to get their hands on raspberries, which is something they have in costa rica but the ones here in the northeast are larger because raspberries require the cold season to properly grow. they also made fun of mango prices around here ($.69, and i thought that was cheap), because where they come from, mango is so abundant they can just go out and pick them off of trees. after all the foodage was done, they all left to go salsa dancing in boston, while i borrowed my parents' car and drove myself back home.